Before 1888, the word “First Aid Kit” had not been coined. No one could fathom the idea of bringing together a number of supplies that could be used in case of a disaster. I am sure brows creased and eyebrows were raised in surprise when some genius from the Johnson & Johnson assembled different medical supplies together and called it a first aid kit. However, over a century later, the first aid kit is now a necessity in every home. A gauze, eye dressings, disposable sterile gloves, and different bandages, among others, carried in a single box may mean the difference between life and death. First aid kits are necessary, and because of that, the choice of the first aid kit is very important. This article is a review of the best medical kits for survival at home, during a road trip, when hiking and even when camping. 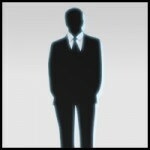 The contents and advantages of each kit will be discussed in detail. All of these products listed below also meet or exceed the Occupational Safety and Health Administration and American National Standards Institute guidelines for the conventional medical kit brought forward in 2009. A neat freak’s dream come true, this first aid kit has everything you could ask for and more. The casing comes with compartments into which you can organize and separate the many different pieces. These compartments make it easy to access a specific medical item, without having to ruffle through the whole item. The hard plastic case on the kit protects it from mild fall, the latch makes it easy to secure and the kit can be hung on a wall using its handle. The OSHA and ANSI guidelines of 2009 require that any first aid kit should serve at least 100 people, but this kit exceeds the guidelines. With the 326 pieces found in this kit, it can serve over 100 people with it’s supplies. This makes it ideal for large families and is a must have for a car emergency kit. The Adventure Medical Kit Trauma Kit is one of the best medical kits for survival because it addresses the one thing most medical kits don’t: the need to stop excessive bleeding. 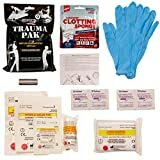 When you are out on your getaway camping trip or maybe it is during that hike, and one person gets a cut that bleeds profusely, this kit can be used to control the bleeding before the medics get there. The quick clot is applied on any bleeding cut, then the cut is dressed with a bandage to ensure the quick clot stays on. The sterile gloves that come with the kit ensure that while you are performing the first aid, you don’t transfer any bacteria to the infected area. The waterproof packaging ensures the contents stay dry and sterile. Are you packing for a trip somewhere? Maybe a survivalist one with your boys? Do you know the survival first aid basics? What about packing for such a trip, do you know what medical supplies you are expected to lug with you? Well, this video here, should give some more insight into how to pack the right way. 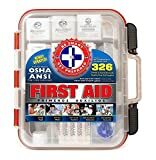 This 299-piece First Aid Kit is a perfect fit for any car, boat, home or backpack because of its softpack exterior. The zipper ensures that every item stays within the kit and the number of pieces makes it usable for a number of people at a time. The supplies are also extensive and they can be used for different injuries and emergencies, from mild cuts to insect stings. Just like its name, this kit helps you be smart and prepares during an emergency, and you have to understand the concept of emergency in first aid. This is because being speed means the difference between life and death in an emergency. This kit aids your speed because of the way it is compartmentalized and organized, and you know where to get what. Moreover, the variety of supplies makes it suitable for use in different emergency situations, from insect bites to cuts and bruises. This kit is also small hence it can be used in your bathroom, in a cabinet and even in your backpack. The hard cover makes it less susceptible to getting destroyed, and the latch secures the supplies. 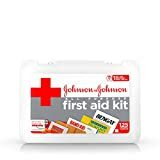 Johnson & Johnson is the pioneer company when it comes to first aid kits, and their Johnson & Johnson Red Cross All Purpose First Aid Kit doesn’t disappoint. First, the hardcover ensures that the contents of the kit stay sterile and are not affected by water, and the double latch ensures it is safely secured. The variety of supplies ensures that you are able to effectively deal with any emergency that comes your way. Moreover, the size and weight of the kit make it easy to carry around. While not having as many items as other choices, this item still boasts versatility. Shallow and deep cuts and insect stings are unfortunate events that can happen to anyone during a hiking expedition, camping, family outing, or what have you. With the first aid kits above, you can be able to deal with these situations. The Adventure Medical Kit can be used for different cuts and bruises to stop the bleeding as medics are awaited. There is a provision for supplies that deal with insect stings within the other four kits, and these provisions can serve more than a single person. You can even continue with your hiking after the injuries have been treated. However, in any situation, it is better to have something for an emergency than being between a rock and a hard place.